For your free health check and to make sure your teams and instance are ready to tackle your next big project, just contact one of our friendly consultants by emailing [email protected] subject line: Health Report. Cprime is excited to announce the availability of two complimentary health reports to allow Jira admins, Business Managers and various other stakeholders the chance to review and refine their projects and Jira instances. The two reports can be run separately or combined to provide a full overall health report. These reports have been crafted using years of agile consulting experience, in order to identify common process and technology symptoms that hide under the surface of your software, processes or both! Currently, in order to assess the health of a Jira instance, companies must spend a couple of days manually assessing their Jira instance to see what is inside and what the issues are. On top of this, every client has a slightly different idea of the things they would like measured in their health reports and without a template, it is hard to include and streamline all the metrics measured in the assessment. Now, thanks to our new health reports, we have a standardized and automated assessment so you are able to know what is being assessed and can receive the report in a matter of minutes instead of a matter of days. Best of all, once the reports have been set up, you are able to receive ongoing reports regularly, using these as a metric to stay on top of the health of your processes and system. Often, with the rapid growth of a company, process and software adoption takes precedence and understandably, there’s not much time to pause, and take count of what’s working and what’s not working. However, clogged up processes or systems will only inevitably lead to huge explosions, so it’s best to remove any blockages well in advance. Agile health reports: Which measures efficiency of your team using metrics such as number of issues without estimates, orphaned issues, ageing issues etc in order to track the productivity of your teams and see where roadblocks or areas of improvement are to ensure projects and tasks are completed with maximum efficiency. System reports: Which measures your Jira, server, database and index using metrics such as free space, connection settings, open files limit, cluster times etc in order to give an overview of how smoothly your Jira instance is running and where there are opportunities to ensure your Jira is running at optimum speed. The system report uses REST calls for reports that already come with the out-of-the-box version of Jira and also executes database queries to identify problems taken from the Jira knowledge base tickets. All the information is presented in an easy to read manner and allows people without system level user access the ability to view this information. Both the agile health reports and the system reports are built off custom csv files allowing for several opportunities to add customization and add specific reports based on the needs of your business and your unique Jira instance. The health report starts off with an overall summary and a score of how your Jira is going before breaking down each report into different sections to further pinpoint the areas of improvement. Further into the report, there are details about each specific test that is run and whether you have passed/ failed the test. If you have failed a test, there is a link to documentation which not only explains the implications of a poor result but also remedies on how to fix any particular issue. 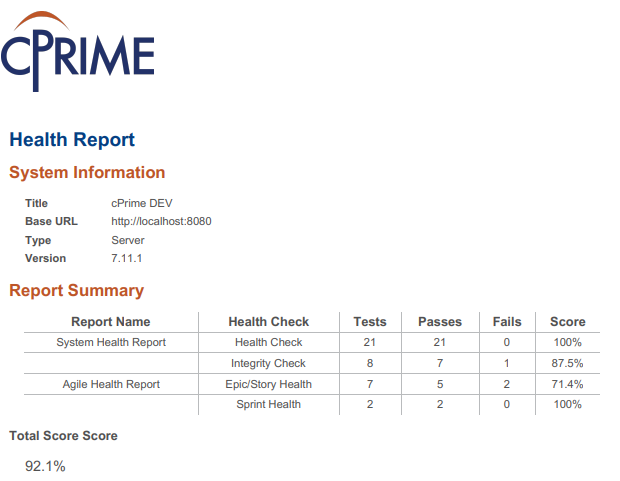 Our Cprime health checks are complimentary for all Cprime customers (ie. if you use Power Scripts™ for Jira, Power Custom Fields Premium™, Power Database Fields Pro™, Power Actions™ for Jira etc) and are essential to ensure that any roadblocks or areas of improvement are addressed as soon as possible. Tending to these free health reports will provide a great foundation for guardrails and governance and establish best practise for Jira Admins, Agile Coaches and the wider organization. Learn more about free health checks below!